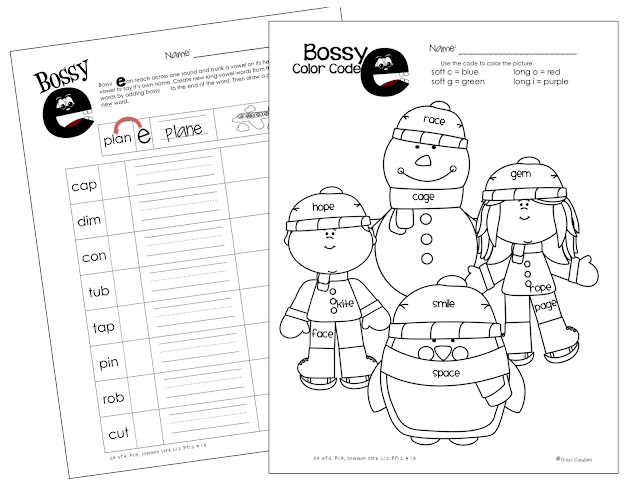 Blog Hoppin': Bossy E FREEBIE! Hey Peeps! In my first grade classroom all of us have FINALLY moved on to long vowels this month! Yay! It's always exciting when we reach this time of year. I thought I'd share one of my favorite long vowel things with you. I LOVE teaching literacy. It's just so fun to see the "lightbulbs" go off as the kiddos get the rules and patterns involved with phonics. In fact, phonic rules are one of my absolute favorite things to teach. Even the kiddos who read FAR above grade level get a thrill out of the knowledge that are rules behind a lot of this wacky stuff that is English. "I KNEW it was a long A word, but I didn't know there was rule!" 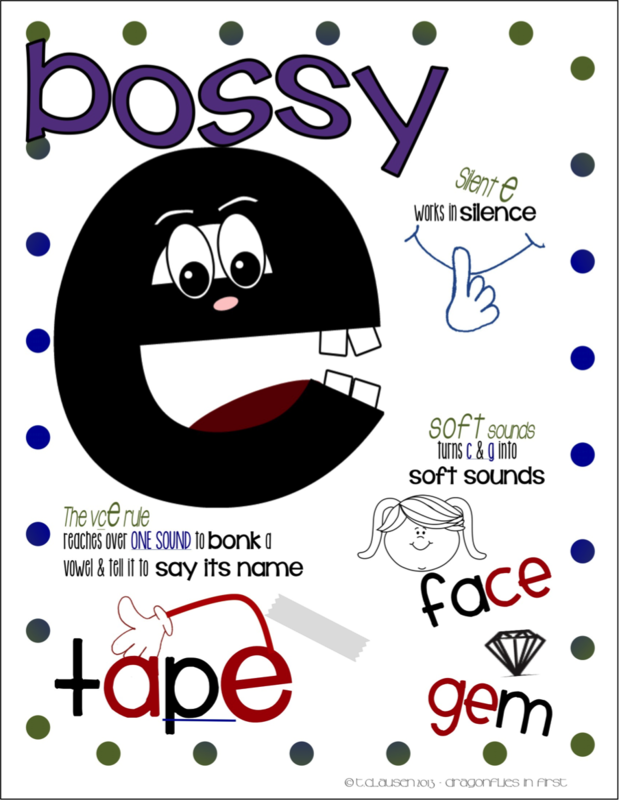 Many of my kiddos who know the e is silent and the vowel it is associated with is long... have no idea there is an actual phonetic rule associated with it. But they "get it" the second you spell it all out for them. The best part is that with the introduction of this rule, a whole new world of reading opens up for a lot of kiddos. Now they can read a variety of readers, books and stories because long vowels become part of the everyday routine. This little e goes by many monikers: Silent e Partner e Super e Magic e Lazy e I am sure there are more. But in my room, we call him Bossy e. Because, well, he bosses letters around. He reaches over one consonant sound and BONKS vowels on the head and tells them to say their name. He makes C and G turn SOFT... and he does all of this in SILENCE. Display this little anchor chart on your wall to copy (trace over) on a large poster paper and you have an awesome tool to which your kiddos can refer while cementing all that Bossy e can do. 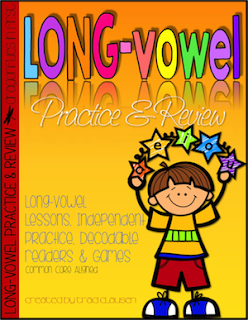 The whirlwind of phonetic rules for long vowels and vowel combinations will fill the remainder of our school year. Bossy e is the best way to start it off! 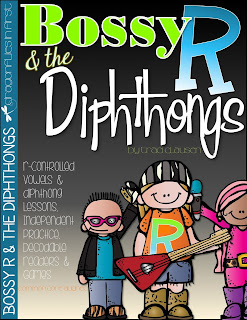 Check out the Long Vowels Practice and Review and Bossy R and the Diphthongs for all kinds of long and vowel combination phonic rule activities! Stop by and visit me over at Dragonflies in First for more ideas and freebies!